Spring is here and now onto Cinco de Mayo preparations! And that's fine by me. Mexican food is easy to make healthy. You can load up on the veggies, and flavor with loads of spices instead of saturated fats (sour cream, cheese, etc). Quinoa is such a great grain. High in fiber and protein it will keep you fuller longer. This recipe is full of flavor. I encourage you to substitute it for rice in your next Mexican meal. In a medium saucepan combine quinoa and broth. Bring to a boil, then reduce heat to medium low, cover, and cook for 15-20 minutes, or until all broth is absorbed. Remove from heat. 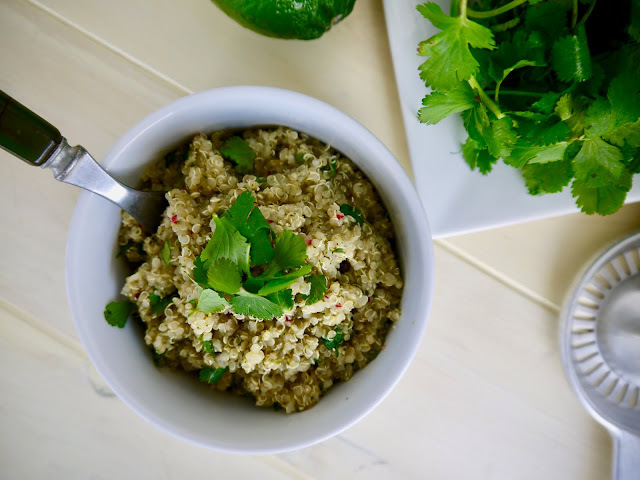 While quinoa is cooking, combine cilantro, onion, lime juice and zest, olive oil, and salt in a large food processor. Mix until a puree is formed. Transfer cooked quinoa to a serving bowl and stir in cilantro mixture. Serve immediately!